I’ll start by saying thank you again for a wonderful photoshoot – one of the highlights of my wife’s 40th birthday celebration which we spent in Singapore that is also our first holiday as a family. In fact, you had managed to put us at ease even before we met as you had shown your flexibility and readiness to be as accommodating as possible when there had been some difficulty with arranging the transfer of the deposit. In these increasingly mistrustful times I certainly appreciated your trust and flexibility. When you first turned up at our hotel door, we were surprised to see quite how much equipment you’d brought with you. In fact, I thought the Hotel reception had maybe got confused and sent us a roadie to set up a rock concert set and sent the photographer to a different room! Upon clarifying that you were indeed the photographer, you proceeded to explain to us what you had in mind whilst all the time inviting suggestions from ourselves. It probably took you around 45 minutes to set up which gave us a little more flexibility in terms of ensuring the Little One was ‘fed and watered’ and in the best mood possible! Throughout the shoot you remained warm, calm and genuinely interested in what was going on. Even better, you had a great rapport with the Little One, managing to illicit plenty of smiles and laughs from him. This is a natural talent you appear to have and anyone wanting to have very young babies and children photographed would struggle to find someone better capable of putting a young (and sometimes irritable) stranger at ease so quickly and efficiently whilst also doing the job. The shoot went on longer than had been scheduled but it was clear from the offset that you were interested in achieving the right results and not watching the clock – something else we much appreciated. All costs had been explained to us before the shoot and anything different or additional we requested, the cost advised to us immediately. Given the confidence that we had already developed in your integrity, there was never any inclination from our side to question any of your charges and when we considered the end results, we were satisfied that we had obtained very good value for money (as a Yorkshireman, a very important objective with anything in life!). Due to our limited time in Singapore, we had to request that you improve (significantly) on your usual lead time for editing and producing the hard copies of the photographs. As with everything else, you were obliging and produced the photographs within 3 days – excellent. I know this meant you spending at least one almost sleepless night to achieve the results you did which again was noted and appreciated. It was really kind of you to come out to meet with us again to deliver the photos and discuss the results with us. The photographs? Well they were alright I suppose…………………….. Seriously, we were delighted! You even got me looking reasonably decent! Our chosen formats had been a combination of traditional and more off the wall formats and all turned out looking great. We loved that you’d come up with some really quite creative formats and enjoyed seeing ourselves in the finished product – not something I have often said about photographs I have appeared in! Producing the montage of our son was also a terrific gesture that really proved to be the icing on the cake. You’re not only an excellent photographer but a really decent guy as well – down to earth, noticeably lacking the aloofness of many so called professionals. You managed to put all three of us at ease not just during the shoot but prior to and subsequently too – it really was like dealing with an old friend. As with any old friend, we hope to see you again at some point in the future. To use bygone language befitting the location………… thanks to you, the shoot was a really rather jolly jape. 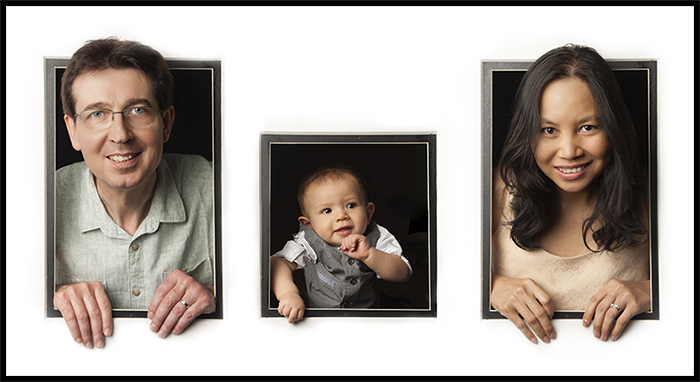 This entry was posted in Family Photography, Testimonials.